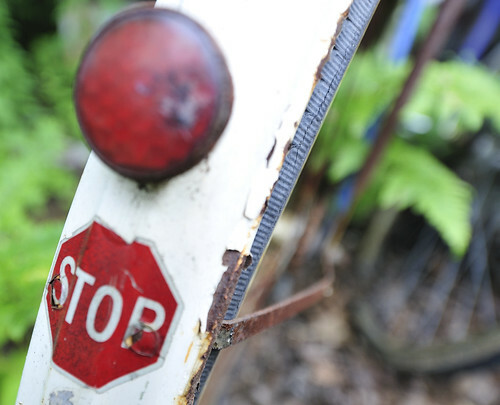 Stop, a photo by Molly Motmot on Flickr. Summertime and the biking is brilliant! Have you noticed how many bike lanes there are now weaving their way through this great city? There are even new paved bikes paths running along the mighty Speed River and back behind downtown Guelph. Leave the car at home and enjoy the wind on your helmet. If you don't have a bike, don't despair. Guelph has some mighty fine bike shops and a pretty fabulous one that sells second hand bikes too. I prefer the old beater bikes myself, they have character and have already taken people on many adventures. To share my mantra for today; "Get on yer bike!"